Now that Marvel has kicked off the summer movie season in a huge way with Guardians of the Galaxy Vol. 2, it's DC's turn to set the box office on fire with Wonder Woman. If the Wonder Woman early reactions are any indication, this could be a force to be reckoned with at the box office. To get fans ready for this superhero adventure, Entertainment Weekly has debuted new photos and the cover of this week's print edition, featuring Gal Gadot, while the actress herself debuted a new poster, which highlights the heroine's iconic weapon, the Lasso of Truth. Gal Gadot took to Twitter to unveil this new poster, while Entertainment Weekly debuted these new photos. The site also got to speak with Gal Gadot, who was asked if she thinks her iconic character, Diana of Themyscira, is in fact a feminist. Here's what she had to say below, while discussing some of the misconceptions of feminism. "Wonder Woman is a feminist, of course. I think people have a misconception about what feminism is. People think hairy armpits and women who burn bras and hate men. That's not it. For me, feminism is all about equality and freedom and [women] choosing what we want to do. If it's salaries, then we get paid equal to men. It's not men vs. women or women vs. men. It was important to me that my character would never come and preach about how men should treat women. Or how women should perceive themselves. It was more about playing oblivious to society's rules. 'What do you mean women can't go into the Parliament? Why?' It's just reminding everyone how things should be. I wanted to play the fish out of water, but I didn't want to play her too silly." The actress also spoke about Chris Pine's character Steve Trevor, who she said she didn't want him to be a 'damsel in distress' and she wanted them to have a very equal relationship. Patty Jenkins revealed that Steve Trevor represents the "perfect fantasy for any modern woman" since he is "really hot" and has a "sense of humor" about the whole thing. Chris Pine revealed that his role was far easier, compared to the work Gal Gadot had to do as Diana. "She has to be the straight woman, that's the harder part. She's delivering lines like 'My father is Zeus' - s- that is just so ridiculous. And she has to say it with a straight face, with a certain amount of innocence and earnestness. I get to react like any human being would to hearing something as ridiculous as that. So I had it easy." 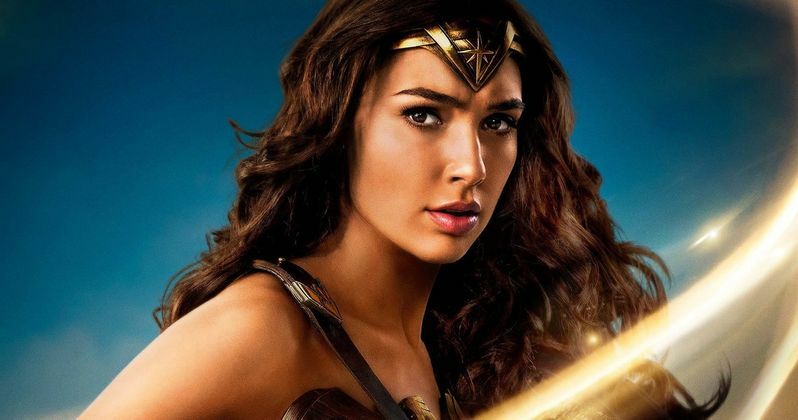 With just a few weeks away until Wonder Woman hits theaters, box office tracking seems to be rather inconsistent, with most analysts predicting a debut between $65 million and $80 million, while others predict a $105 million opening weekend. Since Wonder Woman only has the animated kids movie Captain Underpants as its competition, it could very well meet or exceed those expectations. While we wait for more on Wonder Woman, take a look at the photos and poster below.